Lycium barbarum is a shrub reaching m high. 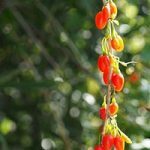 It bears red fruits which are eaten fresh or dried and are very nutritious. Also eaten are the young shoots and leaves, usually cooked as a vegetables (a minty cress flavour) in China. Usually flowers after 2 years, flowers in summer and autumn are followed by the orange-red fruits. They grow in any reasonably well drained soil, making a shrub up to 2.4-3 m (8-10 ft) high, though can be container grown and kept smaller.